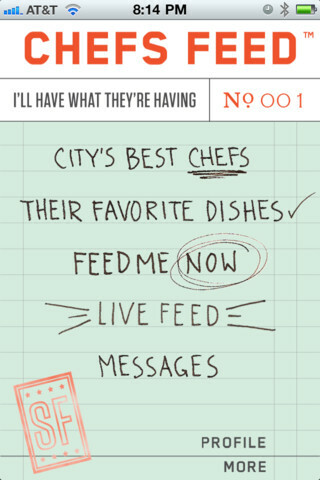 If you, like the Accidental Locavore, often wonder where chefs eat when they’re not working and you’re not hanging out with one*, Chefs Feed is an amusing app. 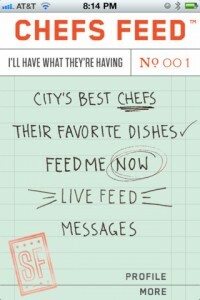 It lists the city’s best chefs for each of (currently) four cities with their favorite dishes, ranging from haute to ‘hood. It’s not apparent how often the basic information is updated, but there is a” live feed” (Twitter) and it’s reasonably live. That’s where the “Plan It” button would seem to come in to play. When you touch it, you don’t get automatically directed to the phone or website (that comes later), you just get it added to your itinerary in your profile. If you should score a huge bonus and a table and order Oysters and Pearls, you can then tell everyone you ate it (the usual suspects, FB, Twitter and email) and rate the dish. Chefs Feed is currently in Chicago, NY, LA and San Francisco, with plans to add Seattle, New Orleans, Boston, Philly and Washington DC. *Masak, the Meat Week kickoff party and tonight, Mas la grillade (but I’m not saying who the chef is).